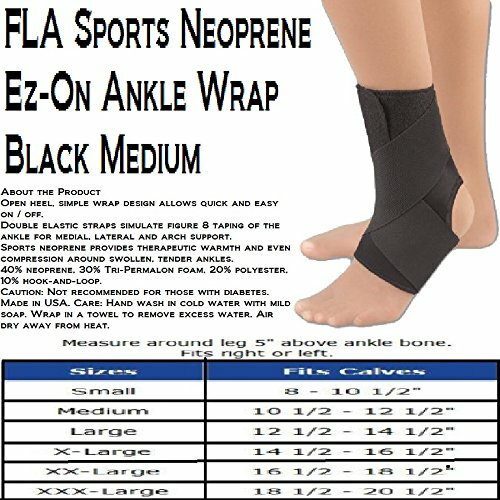 FLA EZ-ON Wrap-Around Ankle Support This wrap around ankle support provides excellent compression and stabilization to weak or injured ankles. The foot and ankle portion is made with sports neoprene for consistent compression and therapeutic warmth to the joint and soft tissues. The top portion is made with Tri-Permalon for cool, breathable wear. A double elastic strap offers adjustable compression to both sides of the ankle and arch of the foot by simulating taping of the ankle in a figure-eight pattern. Great for nighttime wear to treat ankle injuries and control the edema associated with sprains and strains. Color: Black. Indications Mild sprains/strains juvenile arthritis. Tendonitis. Strains/Sprains. Weak ankles. Goals Improve comfort. Increase ankle compression. Decrease anti-inflammatory medications. Decrease ankle pain symptoms. Improve joint stability. Reduce ankle swelling. If you have any questions about this product by FLA Orthopedic Braces, contact us by completing and submitting the form below. If you are looking for a specif part number, please include it with your message.